Alt text or alternative text is the text used to describe what an image is about. For example the image to the right of this text (URL to the image: https://stallion-theme.co.uk/wp-content/uploads/stallion-responsive-wordpress-theme-200×150.png ) has alt text “Stallion Responsive Theme”. You can view the code for the image below, with WordPress this is about as simple as it gets when WordPress adds an image to a post via the Add Media button. Alt text associated with images is very important SEO wise, Google uses it to associate SEO ranking to the image and to the page the link is on. Google also treats the alt text of linked images in a similar way to the anchor text of text links (hyperlinks). An image link is basically a text link (hyperlink) where the anchor text has been replaced by an image (see the linked image to the right and the code below), since an image link tends to lack anchor text, Google uses the alt text to determine what SEO value should be passed via the link. The image link to the above right is equivalent to this text link Stallion Responsive Theme (code for this text link below). It’s difficult to test the relative SEO value of a text link with relevant anchor text to an image link with relevant alt text, I work with the assumption because alt text is semi hidden Google will give more SEO value to anchor text (basically anchor text has more SEO value than alt text when linking out, so if the link matters try for a text link first). 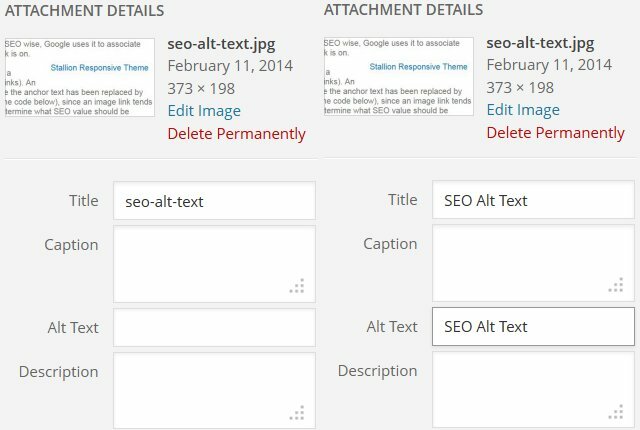 When writing articles if you can add at least one image (not linked) and one linked image (can be to another page on your site) with relevant SEO’d alt text you’ll help your articles rank better in Google and gain image SERPs as well. If you use the Stallion Responsive Theme the SEO Posts Widgets (like the Popular Posts widget on the right sidebar of this site) can include linked images (the thumbnails) with relevant SEO’d alt text. Wikipedia: Alternative text is text associated with an image that serves the same purpose and conveys the same essential information as the image. In situations where the image is not available to the reader, perhaps because they have turned off images in their web browser or are using a screen reader due to a visual impairment, the alternative text ensures that no information or functionality is lost. Absent or unhelpful alternative text can be a source of frustration for visually impaired users of the Web. The image to the right is a screenshot of the Stallion Responsive linked image above using a browser extension to turn images off, this is what a user would see if they used a browser with images turned off. As you can see the Alt Text (Stallion Responsive Theme) is still visible, so take this into account if you do go the alt text keyword stuffing route, you’ll really irritate your visually impaired visitors. Unfortunately WordPress does a rubbish job of dealing with alt text of images added via the WordPress Media Library. As I added the last image with filename seo-alt-text.jpg I took a screenshot of the default WordPress output (left side of the image below). WordPress uses the filename minus the extension (seo-alt-text) as the TITLE attribute and adds nothing to the ALT attribute box! To SEO our images we have to manually add relevant alt text. Because I create images with SEO’d hyphenated filenames (Google treats the hyphen as a space in image filenames: Google reads seo-alt-text as seo alt text) I edit the title attribute box and replace the hyphens with spaces and uppercase the first letters (no SEO value to uppercase, just my preference) and copy the title attribute content to the alt attribute text box (the right side of the image below shows the SEO version). If you’ve been adding images to WordPress using the Add Media Library button etc… and didn’t manually add relevant alt text to your images, you won’t have a fully SEO’d site and should manually edit all your old images to include relevant alt text. Stallion Responsive has a built in feature that adds an alt attribute form to the Media Library (under “Media” >> “Library”). See the screenshot below, the “Image Alt Text” form box is for adding relevant alt text to the images added to the WordPress Media Library. You might be tempted to add an alt attribute (alt=”SEO Keywords”) to a text link like I’ve added to this text link: Alt Text SEO Test. View source of this link and you’ll see a unique made up keyword within the alt=”” part of the text link. On February 11th 2014 (when I edited this SEO article) the made up keyword had no results in Google, when this article is indexed by Google IF alt text added directly to hyperlinks have SEO value you should find. This post being found for the relevant keyword in Google and/or the post the link is to found for the relevant keyword in Google. Very confident this won’t ever occur, alt text within a link (as above) isn’t a valid use of alt text (should only be added to images and image links) and to date (had multiple SEO tests like the one above running for years) Google ignores it. Not sure if this is the right section but it seems the closest to what I’m looking for. I have a question about WordPress image linking. When you upload a photo in the WordPress post control panel, you are given the option to either “Link URL”, “Post URL”, or “None”. Do you have an idea of which is best from an SEO standpoint? I’ve never paid much attention to this feature. I’ve seen it done all three ways and looking at some of your sites, it seems you are using the “None” option(? ), where images are unclickable. 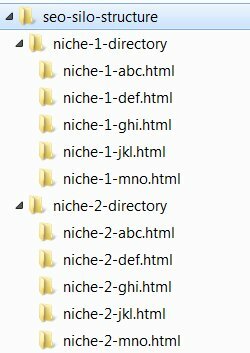 The reason I’m concerned is that my WP has been automatically set to “Post URL”, which I now realize has been essentially creating a separate page for each image. Basically it creates a new page with only the text “This is an image of (image-name)”. When users click any image on my site it takes them to a pretty-much empty page with just the above text and image + the static portions of the site layout (blog title, sidebars, ads etc.) But that’s it. Since I have over 2,000 images on my site, that is a lot of pages it has created. I’ve heard Google doesn’t like “light”, low-original-content pages, and I fear I may be hurting my SEO by having the image links structured in this format. Do you have any sense of how this might affect SEO? I also wondered if this linking structure, essentially linking to each image on a separate page may also be simply sucking Google juice away from good pages and wasting it on essentially blank image pages. Thanks for any thoughts you might have. BTW, it’s been a while since I checked in over here but looks like you’ve been busy! Thanks for all the great work you’ve been doing to help us get the most out of Stallion. 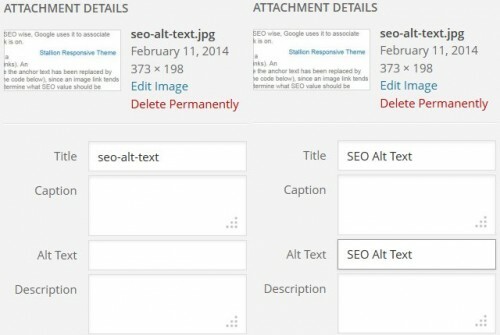 How To Redirect Image Attachment Pages In WordPress? Sorry to jump back on the topic, but just to follow up I’ve been digging for a little more info. I don’t know a lot SEO-wise but I guess logic would dictate that links from every post to a bunch of image pages with practically no content would not be good for SEO. I have also read that simply redirecting image attachments back to the parent page via a plugin will also do the trick. I know there are some plugins that handle attachment redirection like Robots Meta but I think you don’t recommend using that one. I tested Robots Meta and it does seem to work, but I’d rather follow the lightest most SEO-friendly solution, especially since I’ve got a couple thousand of these image pages floating around out there. 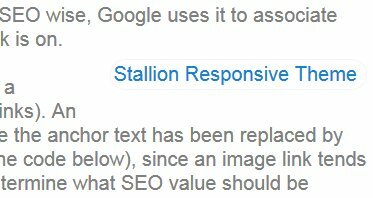 I am running the Stallion WordPress SEO plugin but don’t see a section that handles images. I thought maybe Stallion has a built-in way to handle this that I’m not aware of. Maybe you know the best way to handle this in terms of SEO? Anyway, I hope I am right in assuming that this arrangement can hurt you in Google (recently I think my search traffic got dinged a bit by a Panda update–the first time ever for me I believe–so wondering if this isn’t the reason). Like I said, I had “Post URL” set as the default WP setting and every image I loaded was getting its own image page (WordPress seems to remember the last image url upload setting you were using and applies it to all the following image uploads unless changed). I wonder if I am the only one, but I imagine that there are others that might not be paying attention to this setting and being similarly impacted via the creation of unnecessary image attachment pages. When I started using WordPress the image code generated by WordPress was broken, used to miss out the end /A tag and didn’t add alt text, so I didn’t use the WordPress uploader, I’d upload images via FTP and create the code manually. Doing this gave me full control over how the images are generated etc… but as WordPress has added new features related to images they don’t work as well with manually uploaded images. For example I’m working on a favicon built in plugin for Stallion that currently has about 400 built in favicons and has the option to upload your own images from your PC and a URL. Want to add the ability to link into the WordPress media uploader and have added a new image size to Stallion of 16px by 16px (size of a favicon) which if I can get it to work will generate an image suitable as a favicon from all images uploaded via the WordPress media uploder while Stallion is active which can be selected by the favicon built in plugin so you could use any image uploaded using the WordPress media uploader as a favicon seamlessly (stuck on this bit). If I get it to work my old manually updloaded images won’t generate 16px by 16px images, so won’t be able to use them with this feature, so I’m moving towards using the WordPress media uploader for future feature usage like this one. I guess logic would dictate that links from every post to a bunch of image pages with practically no content would not be good for SEO. When I use the WordPress media uploader I set the image not to link to the attachment form of the image or to the image, I have it set to None. I also make sure all images have alt text (alt=””), WordPress by default uses the filename as the title attribute (title=””) of the link, but this has no SEO value. and copy it to the Alternate Text area. Unless you need a caption and description for the posts leave them black. Select “None” for Link URL the remaining settings have no SEO value either way. that’s as much SEO as you can get from images out of WordPress. If you’ve got loads of images and haven’t followed the alt text advise above you can use a plugin called SEO Friendly Images https://wordpress.org/plugins/seo-image/ which can be set to add a alt attribute to all images. For the autobloggers amongst us this is a must use plugin IMHO. Thanks Dave. I went ahead and did the image.php redirect solution detailed above as it seemed the simplest (I did not want to add another plugin). It seems to be working fine. I haven’t found an easy way to simply remove those attachment links (WordPress doesn’t seem to provide any way to switch attachment settings on an image–ie from a “Post URL” setting to “File URL” or “None” as you have it–on either individual images or in bulk form. And I haven’t found a plugin that does it either). So in lieu of any other solutions I hope this image redirect provides the same practical SEO effect as having image attachments set to “None”, or at least will reduce damage done by linking to those practically empty image pages. I am wondering, though, if by using this redirect solution those image attachment pages in fact still exist on “Google’s radar”, perhaps still having a negative effect? I guess I don’t totally understand the nature of redirect and how Google would view pages that have a redirect applied to them. Do they ignore them, or would these low-content pages “dilute” the overall average quality of pages on my site, continuing to cause damage to SEO? Maybe I need to find a way to completely eliminate these image attachment pages if possible. Thanks for the thoughts on alt tags, I had basically been doing the same (removing hyphens and copying title attribute keywords to the alt text) but have usually not been capitalizing each word. That is a good idea though. It seems the main benefit of that is that it is more attractive when appearing in text snippets in the SERPs (“Amish Buggies Ohio” in your snippet just looks better than “amish buggies ohio”). As always your response was helpful and much appreciated. The SEO solution to a page that’s been deleted/moved is to setup a 301 redirect as you have setup. A 301 redirect does redirect the link benefit that passes through the links to the 301 redirected pages, so the SEO benefit is the link benefit is recovered. The SEO cost is a small amount of the link benefit (a dampening factor), I don’t know how much since Google doesn’t publish that sort of information, but they have indicated there’s a cost and why. The reason for the cost is to remove any potential SEO benefit in chains of 301 redirects where page A redirects to page B which redirects to page C… I’ve not researched what the potential SEO benefit of a 301 redirect link chain could have, but it must have a potential blackhat SEO value** otherwise Google wouldn’t need to put a dampening factor on 301 redirects. ** As I wrote the above the blackhat SEO value of the above was obvious. Take 1,000,000 pages (they don’t have to exist) and redirect them in a massive 1,000,000 page 301 redirect chain. Every page generates a very small amount of intrinsic PR/link benefit, the amount is tiny, but have enough pages and the PR builds up. A setup like this would potentially be like having 1,000,000 links from indexed pages!!! A best case scenario is the dampening factor deletes the PR/link benefit of the intrinsic value of a link from a page (this amount is irrelevant) so the 1,000,000 example above would be no better/worse than a 1 page redirect. More likely Google treats a 301 like a standard link which when Google’s founders developed the PageRank formula set the dampening factor at 15%. It’s probably not 15% today, but it won’t be much off 15%. If the dampening factor of a 301 redirect is the same as the dampening factor of a link assume you loose 15% of the link benefit by adding a 301 redirect, for the 1,000,000 page 301 redirect chain example it would be worthless. I work on the assumption Google treats a 301 redirect as a link and the dampening factor is around 15%. Not a problem for you, but there is an SEO dilemma when dealing with 301 redirects from other sites. If you change a domain or page the general webmaster advice is setup a 301 redirect AND contact webmasters who link to your site/page and ask them to change the link. Sounds like a good idea, makes even more sense after learning Google adds a dampening factor to 301s right. Unfortunately it’s not that straightforward, links from external sites (links not from the same domain) do not pass full SEO benefit from day one, it’s been called the Google sandbox which is far from the best name for this SEO link benefit time based dampening factor. Add a link today and it will pass full PR as seen on the Google ToolBar PR meter and other ways to check PageRank, but the full SEO benefit from a link is not passed for around a year! This is why old sites with a fair number of links rank far better than new sites with even more links, the new links aren’t passing full SEO benefit. Wait a year and full SEO benefit is passed. What happens with 301 redirects? When I’ve setup 301 redirects and not changed the original links the new site/pages quickly (within weeks) takes on the SERPs of the old site/pages (assuming you didn’t change the content too much), there might be small differences, but overall about the same SERPs. If you take the general webmaster advise of contacting the webmasters who own the links to your moved site and have them change the URL you in effect reset the one year full link benefit count which is far more costly than loosing the 301 redirect dampening factor! This is not an issue for internal links, a link from the same domain passes full benefit pretty much immediately. Dave thanks for this excellent answer. What I gather after reading your response is that from an SEO standpoint even this 301 redirect situation affecting a couple thousand site wide links isn’t dealing with that much PR impact to begin with. But I guess it is good to do anyway from what you write, and I will keep an eye out for a way to eventually eliminate those image links in a (hopefully) relatively painless manner (needless to say I have set the WP uploader image attachment to “None” for all future photo uploads!). But perhaps the bigger benefit concerns the accumulation of those low-content image pages and being seen as a content farm. If my site has 10,000 pages indexed, and 2,000 are these low quality image attachment pages, that seems like it is a pretty significant chunk. Or maybe I am wrong and that % of weak pages is not so negative in Google’s view. I am hoping this 301 redirect solution will positively impact that situation (? ), but I guess I don’t completely understand this aspect either–ie, whether the sheer existence of these image pages (even with the 301 redirect on them) will still cause Google to view me as having a lot of low-quality, low-content pages associated with my site, and possibly getting me a penalty as a result. Hmm. I agree, we should not ignore optimizing our WP images. In my WP blog, I usually use original images. That is why I invest time to also search engine optimize the image attached to my post. If we spend time on writing content, we should do it in our WP images as well. Lately people started to realize the SEO importance of image optimization and in fact still there is a vast majority of people who still don’t know the search engine traffic power it holds, although some SEO professionals argue that image optimization only brings hits that are really useless in majority of the cases, but still image SERPs brings in people for you and it brings in a chance that people will visit your blog though majority of the people will go for stealing your pictures yet you get a chance where people might also visit your pages and read your articles. Good on-site optimized WordPress blogs need quality link building service to help increase SERP ranking and PageRank as well. Lets just do a search in Google how optimizing your images might help you in a great way to get hits to your site. For this let me use the keyword “Superman” and search for it in Google and we will check the results. As you can see on the right of the Google search results are images of Superman and why does Google brings in images for this term? Normally you won’t find images being displayed for long tail keywords but rather you will see images for single keywords like Superman, Spiderman etc.. reason is Google made a study what do people look for when they type in certain phrases like Superman and other keyword terms and they found that when people do a search for a definite term like Superman or Spiderman or whatever it is majority of the people who search these terms looked for pictures of it and they return results for pictures in the first results as well. So there is a chance that if you optimize your WP images you use in your blogs properly there is a chance that your images might come in the list of pictures at the top of Google web searches and also in the first page of Google image search there by people will visit your blog. That’s a really good point, a lot of webmasters forget about optimizing their WordPress images and taking just a minute or two extra can help both Google web search and Google image search results. Firstly name your images with SEO in mind, the main WordPress SEO article this comment is attached to is about SEO and Anchor Text, I took a screenshot of what an image on that page looks like with images turned off (you see the alt text) and I named the image seo-alt-text.jpg which is a good SEO name for that image, tells Google the image is about SEO Alt Text sine Google treats hyphens (-) as spaces. Secondly add relevant text to the alt attribute (alt=””). For the image above I added the alt text “SEO Alt Text” which reinforces the image file name. That’s all you have to do to optimize images. At the time of writing this comment this site is relatively new, I bought the domain name over a year ago, but only started adding content about 6 weeks ago (had no content or links: was PR0). This article was added here 11 days ago, so it’s new. Checking Google image search for the phrase SEO Alt Text I see 3 of the images from this article in the top 30, the highest is number 10. Remember this is a new site, new article (new images as well) and yet is still ranking quite high for SEO Alt Text. Where will it be in 12 months time? That’s Google image search, Google web search tends to be harder, I don’t really have an article aimed specifically at SEO Alt Text (yet, there’s one that covers the SERP, but easier WordPress specific SERPs) and there’s no page in the top 30 Google web search. 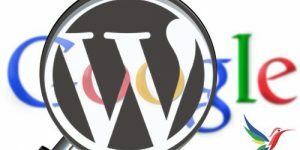 However in the top 20 you’ll find this post https://stallion-theme.co.uk/wordpress-seo-tutorial-alt-text/ for the search “WordPress SEO Alt Text” and for Google Image search it’s 1, 5 and 11. As you can see it’s so much easier to gain image SERPs and they help with related Google web search SERPs.